Basmati rice is our new favorite – long-grained and delicate with a light nutty flavor, & it cooks quickly! We flavored this recipe with cranberries and toasted almonds . . . but think it would be yummy with frozen peas and diced carrots. So many possibilities! Melt 1 tablespoon of the butter in a medium saucepan over medium heat or heat 1 tablespoon olive oil. 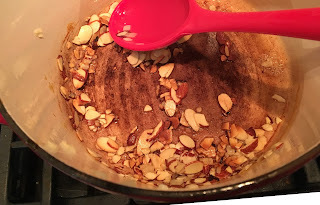 Add the almonds and cook, stirring constantly, until golden and nutty smelling, about 3 minutes. Transfer to a small bowl and reserve. Melt the remaining 2 tablespoons butter (or heat 2 tablespoons olive oli) in the saucepan and add the onions. Cook, stirring occasionally, until softened, about 5 minutes. Add the rice and cook, stirring, until well coated, about 1 minute. Add the chicken broth, 1 1/2 cups water, salt and pepper to taste (start with 1/2 teaspoon of each), and increase the heat to medium-high. Bring to a boil, then cover and reduce the heat to low. Cook until all the liquid has been absorbed, about 18 minutes, adding cranberries after about 10 minutes. Also be sure to check liquid level near the end of cooking time; add more water (or broth) if needed. Take off the heat and let stand, covered, for 5 minutes. Stir in half of the reserved almonds and half of the parsley; season with salt and pepper. Garnish with the remaining toasted almonds and parsley.